Synoptic’s Mesonet API is a powerful and fully scalable service for accessing an expansive database of real-time and historical surface-based weather observations from over 75,000 public and private observing stations, yielding 34 million observations available to Synoptic users. This RESTful API is a request-based data delivery service using a simple HTTP call that can extract minutes or years of data in seconds for locations across the globe. Synoptic's Mesonet API allows for complete customization via an API call, allowing the user to request specific variables at any time for an exact location anywhere on the globe, find all stations within a certain radius of a location, and more. Some example Mesonet API services are described below. To learn more and get access to the API, click Get Started below. Time Series: Returns data for a station or set of stations based on a user-defined time span. Latest: Returns the most recent observation from a station or set of stations. 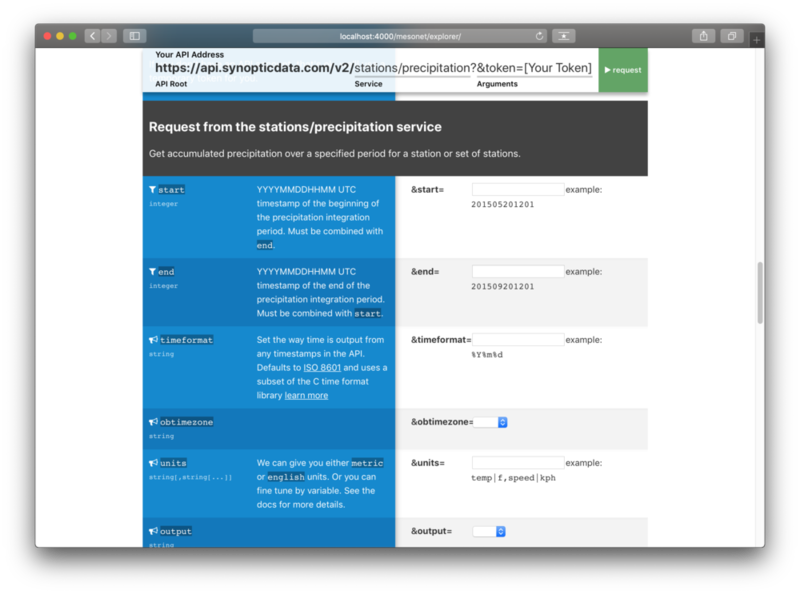 Precipitation: Integrated precipitation amounts from any reporting station for an entire period or custom intervals. Metadata: Returns station metadata including location, elevation, and parameters observed. For more information regarding pricing for the Mesonet API, please see our Pricing page. Ready to get started? Click Get Started below to sign up and receive your free API key.